If during your trip to Italy, you find yourself in need of aspirin, bandaids or cough syrup, or you need prescription medication, you'll have to head to a pharmacy, or in Italian, a farmacia. This article explains how pharmacies function in Italy, and what kind of medical supplies and assistance you can find at them. Open pharmacies display a green neon cross out front, making them easy to recognize, even from a distance. The number and opening hours of Italian Pharmacies are regulated by law. Pharmacies operate on a "rota", or rolling system designed to ensure an open pharmacy (or one which can be opened in a medical emergency) in each general area at night, holidays and Sundays. Each farmacia displays a card with its own opening hours, emergency telephone number, and where to go outside of those opening hours for emergency services. 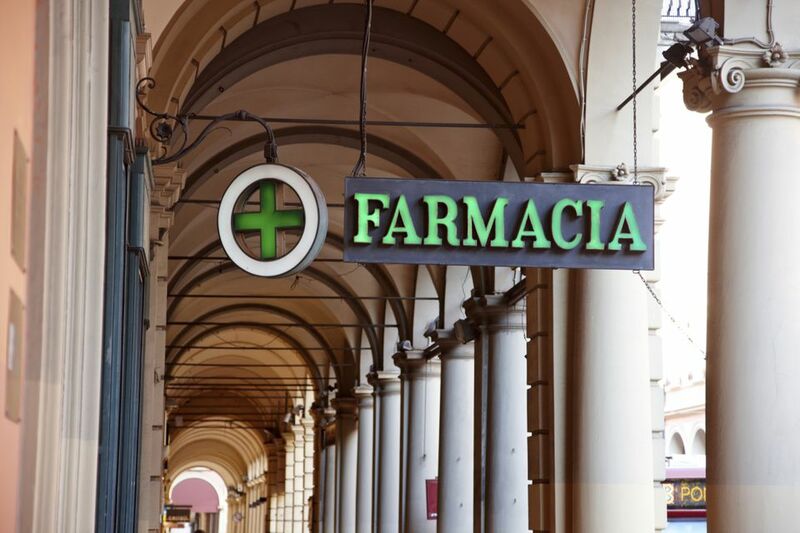 The Italian pharmacy, or farmacia, doesn't deal in many non-medical items, but they do have a monopoly on over-the-counter medications like aspirin and decongestants. Pharmacists in Italy are allowed more leeway in dispensing health advice and selling pharmaceuticals than in the US. If you can describe your condition well, you may be able to procure a prescription directly from a pharmacist in Italy. Likewise, if you need a prescription filled on an emergency basis, you may be able to do so—if you know the scientific or generic name of the medicine you need and can make a good case for the pharmacist to dispense it. For minor aches and pains, cold or flu, and "little" non-critical emergencies, your best bet may be to head over to your local farmacia. You'll go to a farmacia for aspirin and even vitamins. Italian pharmacies will often carry homeopathic and herbal remedies as well. Many Italian pharmacists speak at least a little English. If you are suffering something more serious, or have had an injury not likely to be helped by over-the-counter meds or minor first aid, you can go to the 24-hour emergency rooms, or pronto soccorso, at any hospital. If you are unable to transport yourself, the toll-free medical emergency telephone number in Italy is 118. You may get an ambulance by calling this number, or if you do not require transport to a hospital, the First Aid Service (Guardia Medica) will be sent. Carry the medications in their original container. Carry all medicines with you in your carry-on bag. Keep a copy of your prescriptions with you. Know the generic or scientific name of the medicine. The latter advice is crucial if you need to replenish a medicine during your trip. American pharmaceutical firms often give proprietary names to their version of common medicines and these names are not always recognized overseas. The information you carry should be typewritten for clarity. While most U.S. pharmacies of drug stores sell a wide range of non-health-related items, including food, toys, and home supplies, pharmacies in Italy are more limited in scope. You won't find snacks—other than mints and gum—or cleaning supplies or a wide range of cosmetics. But at most farmacias, you will find baby toys, gluten-free food items, sun cream, a limited selection of make-up and a dizzying array of lotions, creams, and gels designed to make you look younger. Most also sell some Made in Italy perfumes and soaps that might make nice gifts to bring home.